FREE MICHIGAN: Banks Need To Come to Table With Chrysler - OK, Can They Sit Next to the UAW? Banks Need To Come to Table With Chrysler - OK, Can They Sit Next to the UAW? Sometimes, it feels like we spend too much of our precious energy - don’t worry, Free Michigan uses alternative fuel – knocking the governor. It’s hardly partisan, though, and we can only dream of the Engler days, when it was even easier to show an overstuffed bureaucrat blowing smoke. But today, Gov. Granholm sent a letter to Chrysler creditors beseeching them to come back to the bargaining table and hammer out a deal with the failed automaker. "With just over a week to go before the government's restructuring deadline, I urge you, too, to do your part to avoid the devastation that a bankruptcy or liquidation will bring," Granholm wrote in a letter sent to the presidents of J.P. Morgan Chase, Citicorp, Morgan Stanley and Goldman Sachs, as well as investment funds Oppenheimer Funds, Elliott Management, Perella Weinberg Partners, and Stairway Capital Management. "Your action is inconsistent with what should be our common objective in helping advance America's economic recovery." Which is fine. The banks received taxpayer money and perhaps could share the wealth. But Chrysler, too, has received billions in bailout money, and cannot come up with a life saving plan. 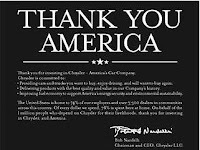 It did, however, find the $$ to thank us all for the money in some pricey print ads. But we wonder why Granholm has sent no letter to the UAW, asking it to shoulder some concessions. There is no doubt that there is some room to move there, and the union is part of both Chrysler’s and GM’s problem., although the union would dispute that. In an interview with CNBC last week, Granholm said that “all this talk about bankruptcy creates a downward spiral… I think some of those holding that debt will walk them up to the brink.” Yes, they will, and perhaps will even ask for the money that is owed them by Chrysler. But perhaps if they saw other well heeled entities pitch in, like the UAW, they may be more inclined to take a constructive part in the discussion. By excluding the UAW from Granholm’s little missive, it just makes her effort one more political play for favor with constituents. Which is exactly what Engler would have done.